This Sunrider soft top made by Mopar is identical to the original equipment soft top for Jeep Wranglers. It is available in a standard material made of a poly-cotton blend that is coated with vinyl to keep out the weather OR a premium four-ply black cloth acrylic fabric for better thermal protection and a quieter ride. 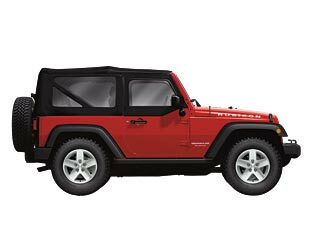 The Sunrider soft top is designed to make it easy for you to enjoy the fun of open-air driving in your Jeep, with zip-out windows and two quick-release latches that let you raise or lower the top with little effort. Choose either the "sunroof" option or the full top-down option. The improved system eliminates the need to tuck the side rails. Black, 2 or 4 Door, complete Hard or Soft-Top replacement. Features privacy tint windows. Please select color and model above.